With St. Patrick's Day a couple days away, it seems appropriate to feature some green-hued foods, don't cha think? 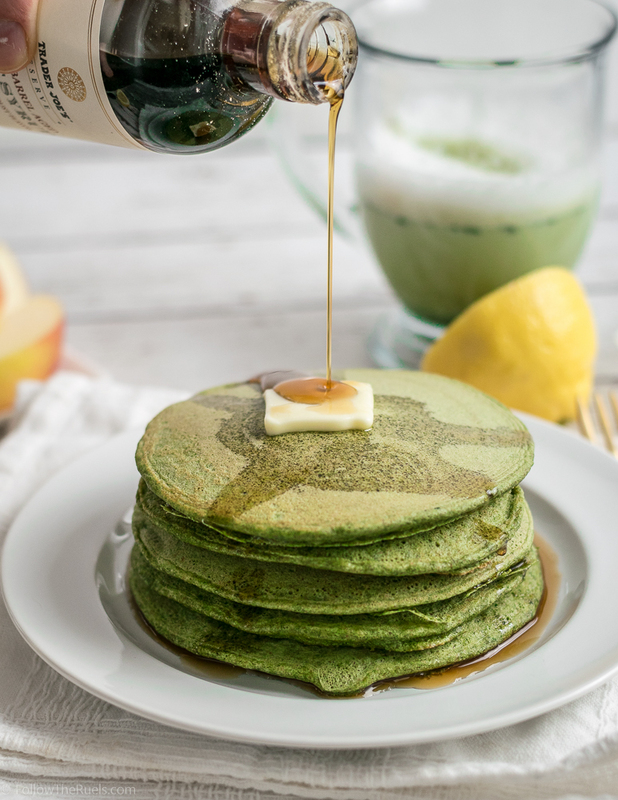 These fluffy green pancakes were actually inspired by those pancakes the Internet gave Chelsea Clinton such a hard time about. I guess I wasn't as disgusted as everyone else, because I thought they would be perfect for St. Patty's Day! Also, what a good way to sneak some extra veggies into your diet? Before you are completely turned off by spinach in your pancakes, let me assure you that they don't taste anything like spinach. You can't taste it at all! 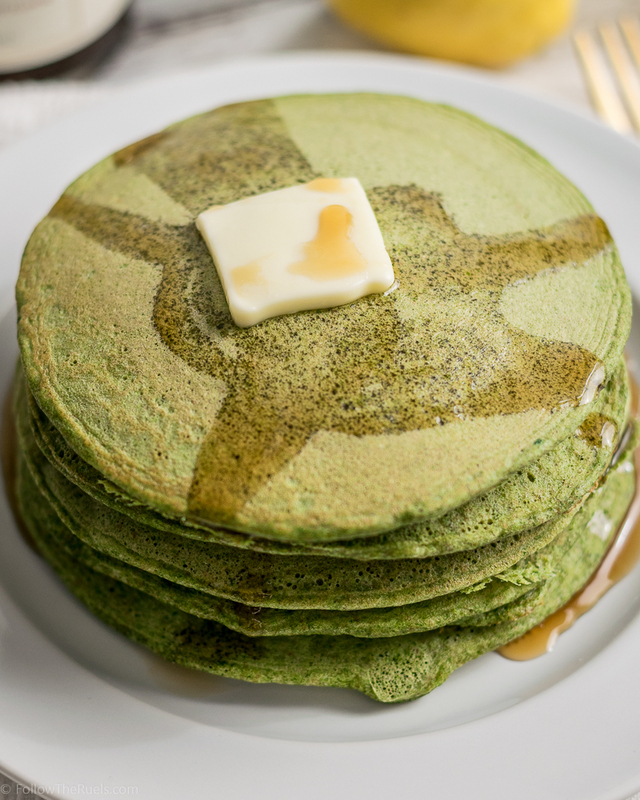 So you really could trick your kids into thinking you made green pancakes just for St. Patty's Day! 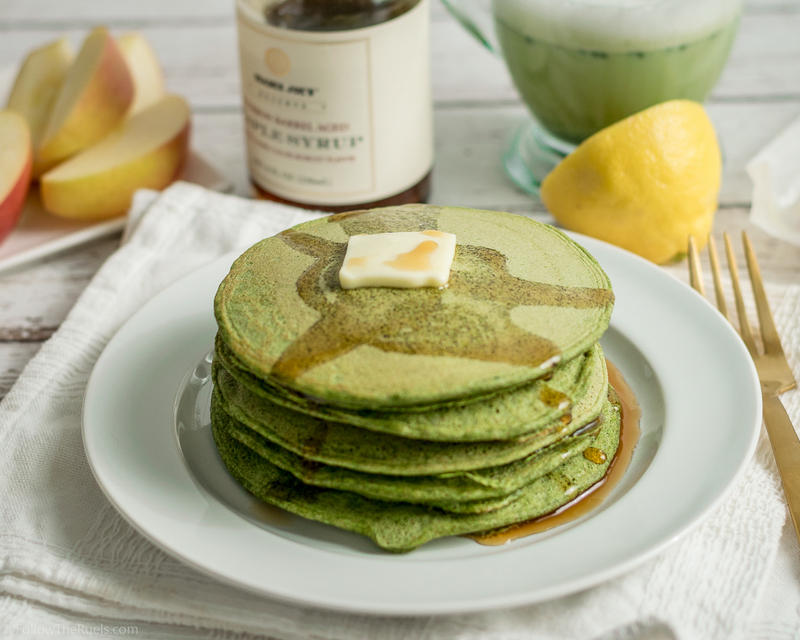 These pancakes don't just get their green color from the spinach. There is also a bit of matcha green tea powder in there to get it an extra umpf. It aslo gives these pancakes a bit of caffeine, which I am not going to turn down in the morning. Start by blending together the spinach, egg yolk, milk, lemon juice, and butter until it resembles that green smoothie you force down ever not and then (just kidding, I love green smoothies!). Then add the flour mixture to the blender so that the blender does all the work, not you. I would suggest adding just part of the flour mixture at a time, otherwise the blender will just get overwhelmed and you will end up stirring it yourself anyways. 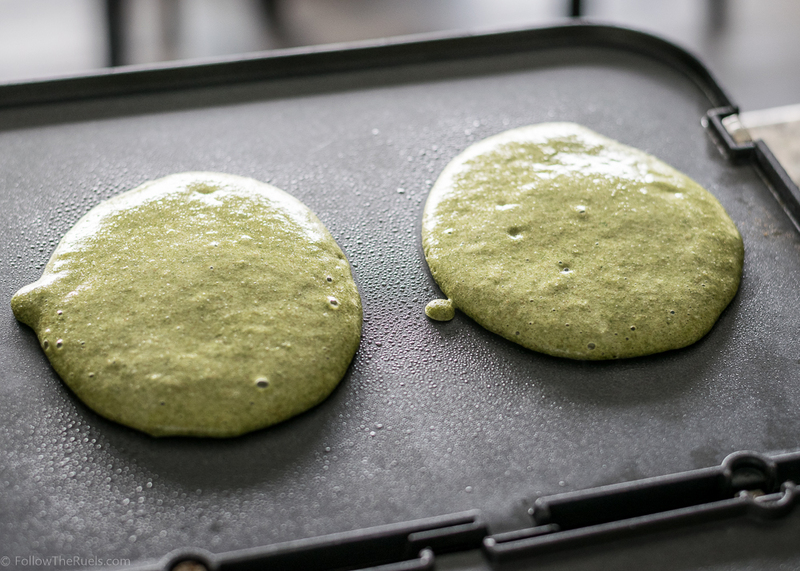 You should be left with a smooth, green batter. It's okay if there are a couple lumps though. You don't want your pancake batter over mixed. Then pour that batter into a bowl with some whipped up egg whites. Oh yeah, this is the key to light and fluffy pancakes. Separate your egg white from the egg yolk and whip it up until light and airy. Then fold the batter into the egg whites so you have a light and airy batter! Spoon about 1/4 to 1/3 cup of batter on to your cooking surface of choice. I prefer our electric griddle because it holds a constant, steady temperature ensuring I don't under or overcook my pancakes. Then just stack up your pretty green pancakes and top them with your favorite pancake toppings. I prefer butter (and lots of it) and some maple syrup. Sure that sort of negates the "healthiness" of the spinach and whole wheat flour. But the way I see it, I would be dousing my pancakes in butter and syrup no matter what. So at least this way I am getting in a serving of veggies! If the Chelsea Clinton green pancakes turned you off from adding spinach to your pancake batter, I hope I have helped sway you the other way. Because it's always a good idea to trick your kids (or your husband...or yourself!) into eating more veggies. Thaw the spinach in the microwave. Line a bowl with a couple paper towels and pour spinach into the bowl on top of the towels. Wrap the towels around the spinach and press out as much moisture as possible. Add the two egg whites to a bowl, and whisk on high using a hand held or stand mixer until they form stiff peaks. About 2 minutes. Then set aside. Add the spinach, egg yolk, milk, butter, and lemon juice to a blender and blend until smooth. In a separate bowl, whisk together the flours, sugar, matcha powder, baking powder, and salt. Spoon half the flour mixture into the blender, then blend for just a couple seconds. Add the rest of the flour and blend until just combined. Pour the batter into the bowl with the egg whites, and gently fold batter into the egg whites until completely incorporated. Head a skillet or griddle to medium heat (about 300-350 degrees), pour batter onto griddle and cook until bubbles form on the surface. Use a spatula to flip the pancakes over to the other side. Cook for another 1-2 minutes, until the bottom is completely cooked. Continue until all pancakes are made.